Wow... A blog entry after all this time! Life has been a little busy and although I have worked on a number of projects since my last entry, I haven't really had the time to update the blog. I have also been focused on a number of house related projects, family life, scouts, and coaching robotics teams. Life has been feeling a fair bit more orderly lately though and I am hoping to get back to accomplishing the crazy projects I use to love blogging about. So a few years ago I started working on a drink machine that I called the Mixer Elixir. The Mixer Elixir will be able to combine 8 different ingredients together to make various cocktails. I will have a “potion” book on the laboratory workbench which will list out a number of different “potions” that people will be able to dial into a control unit and have the Mixer Elixir create the drink. One of the first pieces of technology I need to develop is the control unit. Below you can see a diagram of the rough design. There is a control unit that will sit on the laboratory workbench. It will look like it is hooked up to the experiment on the workbench however it will actually be wired into a server where my custom control software will be running. 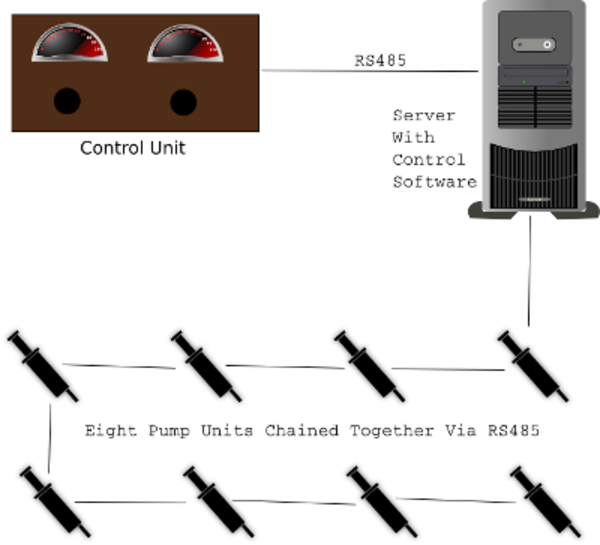 I could have the control unit control the pumps directly; however, I believe it will be nicer to manage the database of drinks and their ingredients from a computer workstation. I could still update the control unit with recipes from a computer into the control unit, but the control software will also add even more flexibility to how I control the experiments in the laboratory. The pump units which actually pump the ingredients into the drinks are shown as syringes below because that is what the pumps are literally going to be... servos actuating syringes. I figured the syringes would then be sterile/food safe and I will be able to accurately control the volume that the pumps put into the drinks. So the control unit needs to have a display to show you which drink you have selected... 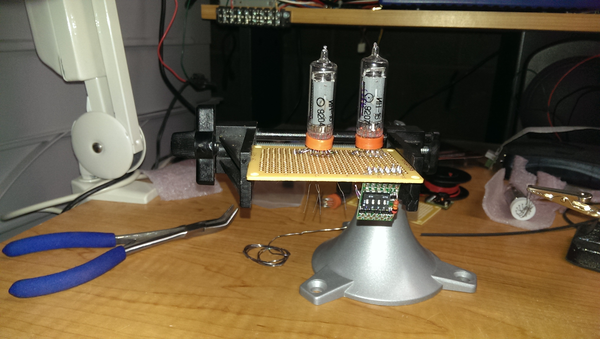 I decided that nixie tubes would make an excellent numerical display for the control unit and look excellent in a mad scientist laboratory setting. 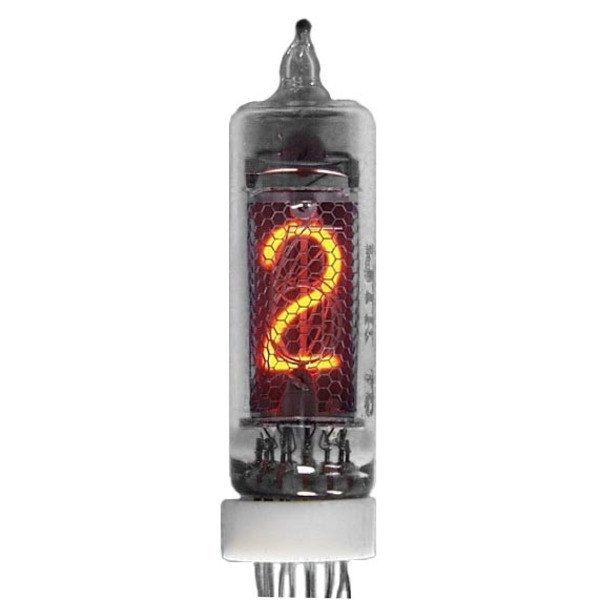 I found a wonderful website http://www.tayloredge.com/ which sold nixie tubes and circuit modules that handled the high voltage details of powering and controlling the nixie tubes. I love working with digital electronics but still have a few things to learn about analog circuitry (I didn't want to do a bunch of learning with high voltage circuits!). Taylor provide a wonderful set of modules that I can just integrate with my avr micro-controller to control the tubes. Here I have started to put together my display interface for my control unit. 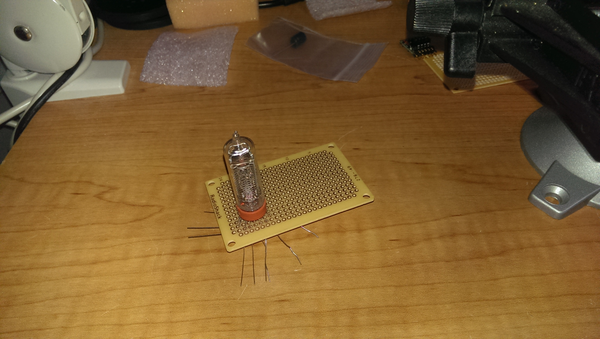 1 nixie tube attached to the interface board. 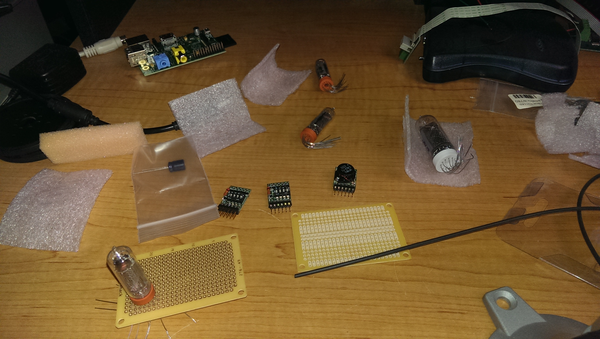 Nixie tubes and other circuit modules. The modules with the dip switches are control modules. 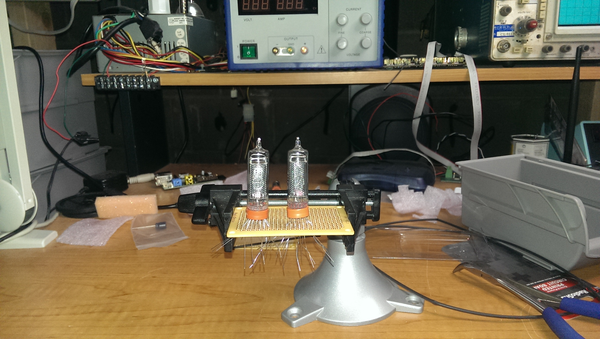 The module with the transformer coil is the power supply module for the nixie tubes. Two tubes equals a possibility of 100 different drinks. One of the control modules attached.